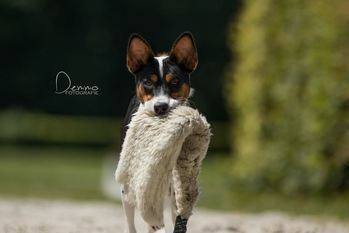 Hunter is Maeva's second tricolor son from the "Turin Brakes" litter. He lives up to his name: he's a very talented hunter at the race track! We are curious to see how he will perform at the race track and coursing field in the future. Hunter's pedigree name "Jet Trail" refers to the beautiful white stripe on his head. Of course, it's also a Turin Brakes' song. Please click here to listen to the song!